Learn about the docs and in-product docs that can help get you up to speed. Wavefront offers an onboarding workflow, tutorial and tour dashboards, in-product help, docs, and other resources. The Getting Started onboarding flow gives a overview of the Wavefront architecture, and a preview of dashboards and alerts. All trial users go through this flow before they can continue using Wavefront. The tutorial dashboards and the tour dashboards help you get acquainted with the query language, alerting, chart types, and other Wavefront essentials. These dashboard highlight some of the features that make Wavefront special – and show you how to use them. The in-product help on the right of each screen introduces what you’re looking at – e.g. charts or alerts – and has links to more info. This doc set (docs.wavefront.com) has in-depth information about many different aspects of the product. The following documents are great for getting started with Wavefront. If you want a condensed set of documentation, focus on the categories and topics with a icon. The in-product Getting Started onboarding flow gives a overview of the Wavefront architecture, and a preview of dashboards and alerts. If you are a trial user, it leads you through the process of setting up your first integration. When you log in to Wavefront the first time, the Getting Started workflow displays automatically. To access the Getting Started workflow later, click Getting Started in the Wavefront task bar. You can use the customer-wide or user-level preferences to control whether Getting Started is visible in the task bar. You can go through the Tutorial: Getting Started in this doc set for the basics. Once you’ve signed in to Wavefront, you can go through Wavefront Tutorial – one of the Featured integrations. 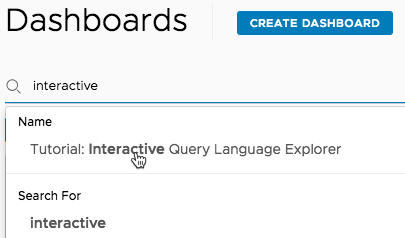 You can also explore with the Interactive Query Language dashboard. The following docs are great for learning what Wavefront is, how to get data into Wavefront, what you can do based on your assigned permissions, and how to organize and search in Wavefront. These docs also explore the main objects in Wavefront: charts, dashboards, alerts, events, and integrations. Here are some links to popular docs and videos. You can also search this doc set (top right) to find what you need. You can find most videos on our videos page. We’ve also included those videos on pages where they’re most useful. Dashboards make it possible to save multiple charts in a single location for future use. The following topics and video help you learn how to create and use charts and dashboards in Wavefront. The Wavefront Query Language is the foundation of charts and alerts in Wavefront. The following topics help you learn the query language. We also have a complete list of Query Language Reference Pages. Alerts and events make it possible to track critical changes in your environment. The following topics help you learn about alerts and events in Wavefront. Release notes summarize the features added to each release and changes to existing features. Select Integrations and click the Tour or Tutorial tile. Tour dashboards give an overview of Wavefront features and illustrate how to use them to address operational challenges. These dashboards are identified by the dashboard tag ~welcome.tour. Tour: Welcome to Wavefront - gives an overview of benefits and capabilities. Tour: The Needle in a Haystack - demonstrates how to find an anomalous event. Tour: The Perfect Alert - demonstrates how to create an alert that fires only when there’s really a problem. Tour: Analyzing an Event’s Impact - demonstrates how to discover the effect of a code push on metrics. Tour: Data Exploration and Capacity Planning - demonstrates how to correlate metrics with each other. Tour: Week over Week Anomaly Detection - demonstrates how to use historical data to establish a pattern and then create a visualization that captures when a service issue occurred. Tour: Sample Cluster Metrics - displays metrics from a cluster containing several types of sources (application server, database, host, network, etc.). Tour: Sample Telegraf Metrics - displays metrics from hosts where the Telegraf collector agent is used for system metric collection. Tutorial dashboards illustrate how to use Wavefront features to construct queries, display data returned from queries, and create alerts. These dashboards are identified by the dashboard tag ~welcome.tutorial. Tutorial: Introduction to Wavefront - contains links to getting started dashboards and documentation. Tutorial: Getting Started with Wavefront Query Language - contains charts that illustrate different elements of the Wavefront Query Language. Tutorial: Dashboard Basics: Chart Types - introduces dashboard chart types and options: line, point, stacked area, scatter, etc. Tutorial: Creating Alerts - explains how to create an alert and configure notification of the alert. Tutorial: Code Push Event - explains how to use the Wavefront Query Language to develop queries that explore the effect of a code push event on a collection of servers. Tutorial: Use Case: Anomaly Detection - describes how to use the Wavefront Query Language to investigate anomalous application behavior.